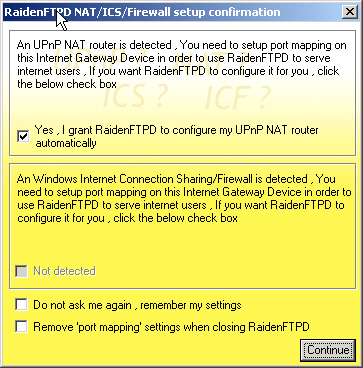 Q : How to let the RaidenFTPD to configure your UPnP router/ICS/ICF automatically? A : Running a ftp server behind a router (NAT) had always been hard, almost nobody can success without necessary knowledge and manual configuration on routers and ftp server softwares, you usually need to apply for a dynamic IP domain name, configure your router manually for port mapping setup, configure your ftp server manually because it is behind a NAT so it does not know your real Internet IP-Address for passive connections to use. Q: How to bring back the yellow popup dialog box if I clicked not to display it again? Q: I bought a new router but the RaidenFTPD gui console displays my old router info?! A: please delete the router info cache file called ''UPnP_IGD.cache" inside your RaidenFTPD dir. 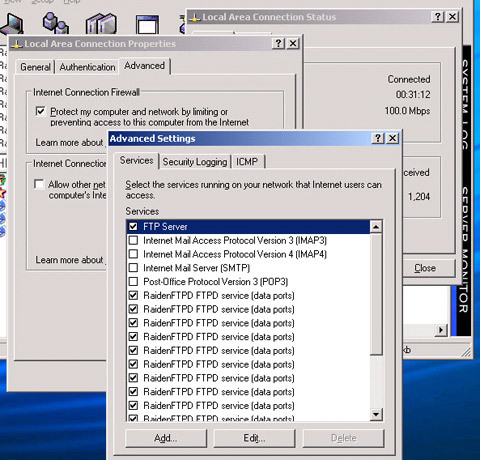 A: Your router may have some problems , try to open a MSN 6.0 messenger and see if a port mapping for MSN is added to your router , if not you can call your router vendor now.